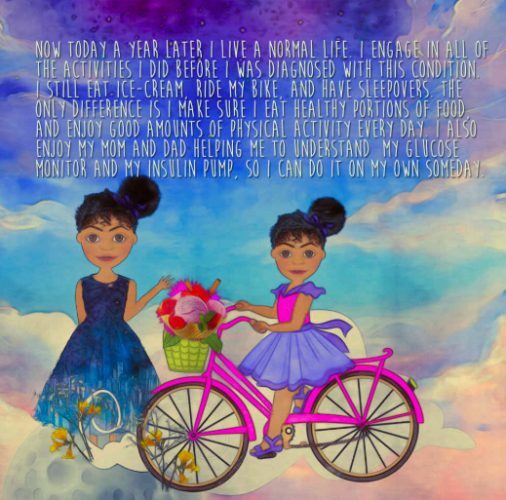 dLife is happy to share DiabetesMine’s feature of Shelly Johnson, author of a new diabetes book, entitled I Am Not Afraid: Surviving Type 1 Diabetes. Johnson’s young daughter, Aubrie was diagnosed with type 1 diabetes nearly three years ago. The experience was traumatic for Johnson herself, but she wanted to know how it was for her little girl. So she spent several months talking intensely with her daughter, and last year, published a children’s book from her daughter’s point of view. 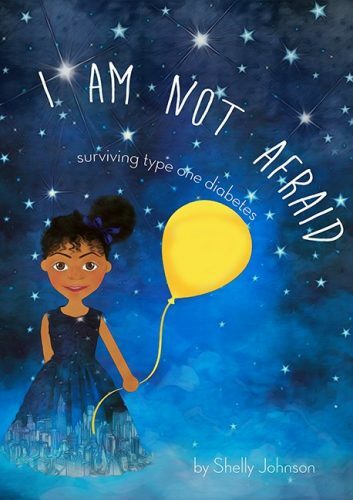 That illustrative kids’ book, I Am Not Afraid: Surviving Type 1 Diabetes shares a little girl’s story of beating fear and learning to “be normal” with T1D. Enjoy the following interview with Johnson, courtesy of Healthline’s DiabetesMine. Hi Shelly, can you start with your daughter’s diagnosis story? In April 2016, my daughter Aubrie was 4 years old. A few weeks before, her dad had noticed that she had started losing a lot of weight. He was the first to notice because she is always with me so I didn’t notice it at all. Aubrie had also started to go to the restroom a lot and had a bad yeast infection. I decided to take her to the doctor two days later because it was my next day off. However, in the morning as I was preparing breakfast, I turned around to see that Aubrie had finished her entire bottle of 16-ounce water in less than a minute! I knew something was wrong, so we called her doctor. She was not able to get an appointment until 2:00 pm. Her dad rushed her to Texas Children’s hospital emergency room. Turns out her glucose levels were nearly in the 600’s. When we arrived about five doctors grabbed her from us and rushed to give her IV and run tests on her. I was so scared I asked the doctors so many questions. One in particular was, were they going to diagnose her with type 1 diabetes? One nurse looked at me and said, ‘Yes, please calm down.’ She said she was glad we got her in today because if it had been any longer she could have gone into a diabetic coma and possibly could have died. I swear, I stopped breathing for a minute. Afterwards, we spent four days in the hospital. We learned so much important information, and Texas Children’s Hospital is phenomenal, might I add. We learned so much helpful information to take our daughter home and properly care for her. Her doctor, Daniel DeSalvo is an amazing doctor. He himself has type 1 diabetes. He researches in diabetes device technology, including closed-loop Artificial Pancreas systems. Is there any family history of diabetes? My mother and father both had type 2 diabetes. My mom and dad have five kids together. My dad has six other kids from a previous marriage and none of my brothers from my dad or his kids have type 1 diabetes. Now my younger brother and I of the five kids are the only two that have more than one child, and both of our second children have type 1 diabetes. How is Aubrie doing these days, a few years after diagnosis? Aubrie is 6 now and is using the Dexcom CGM and OmniPod pump. She’s doing amazing. She’s gone from an A1C level of 13% to 7%. She pricks her own finger and counts carbs and enters the information into her pump all by herself. So what inspired you to write a children’s book? This is a book of my daughter’s story straight from her perspective. I felt my daughter’s story should be heard. Her voice is so little, yet it was so powerful and encouraged me to advocate for her and to reach my advocacy into many communities. I am an educator so I decided to take off work from work April until August, and during this time I learned about type 1 diabetes. I decided to ask Aubrie to tell me her story herself, to understand how she was feeling, so she really crafted the book and story you have before you. What’s the storyline? And what makes this diabetes children’s book unique? The main character in this book is little Aubrie, just diagnosed with T1D. The story takes young readers through that initial experience of being at the pediatrician’s office and then being admitted to the hospital. It describes how her mom and dad learned all about the basics of D-management, and the eventual trip home. It ends on a positive note about a year later, when young Aubrie is happily living life and able still enjoy ice cream, ride her bike and go to sleepovers. Aside from the “story” aspect, the book also includes a glossary and info on T1D warnings signs. This book is designed to teach kids and their parents the vocabulary associated with T1D. It includes an easy-to-understand list of key terms. The illustrations are so bright and charming. Who did the artwork? For the graphic design, I used Fiverr, which is an online platform of freelancers where you can find individuals to do whatever the task for a fee. I found a children’s book illustrator there, to create the artwork for my book. What kind of response have you had so far from the Diabetes Community? I found many of the online diabetes communities on social media through a research program at Texas Children’s Hospital called First Steps. I participated in many of their programs, and this helped me to gain online support with families and mothers just like me. Feedback has been amazing so far. They have been very supportive. I recently did a book signing on Dec. 19th for my daughter. You mentioned that you work as an educator? Yes, I have been teaching intermediate and elementary students for nearly eleven years. I am now pursuing my Master’s degree in Curriculum and Instruction. Have you brought your new book into schools to help raise awareness? I have brought the book into my own classroom. I am also raising awareness by going to monthly meetings associated with Texas Children’s Hospital. What would you like people to take away from your daughter’s story? My main mission is for parents to understand that they are their children’s advocate. They should be the first to know when something is wrong. I also want communities to understand diabetes and the difference between type 1 and type 2. Each type leads to changing lifestyles and our way of living. I also want parents and children to know that they are not alone. Mothers and fathers of T1D kids have children who are very normal just like any other kid. Communities should help other communities. And above all, people should not be afraid. Republished with permission of DiabetesMine and Healthline.